UPDATE for 2019: The Lottery for a parking pass to view the Synchronous Fireflies is open April 26-29. You can register here: recreation.gov. Lottery winners will be announced May 10. The dates for the viewing are May 30 – June 5, 2019. 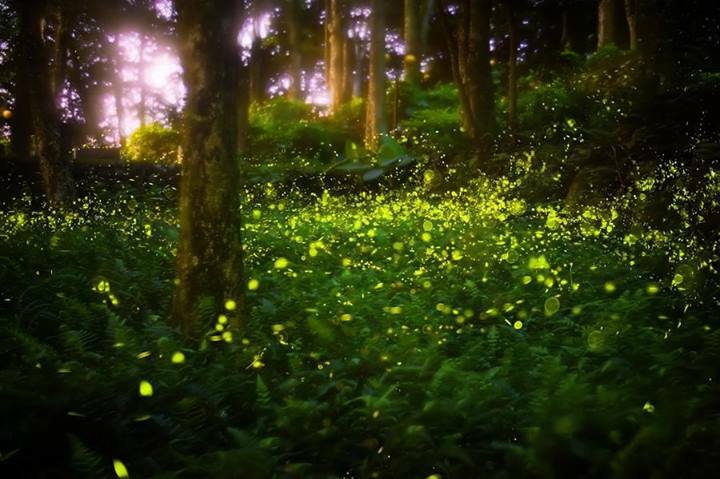 Every spring you have a chance to see thousands of fireflies light up at once in the Great Smoky Mountains. This event is the only one of its kind in North America, and the rangers of the Great Smoky Mountains National Park release a limited number of tickets to view the event every year through a random lottery. Many of us have fond memories of warm late spring evenings spent in the outdoors, often peppered with the glowing lights of fireflies around us. If you were lucky you might get to see a few dozen in one place at one time. Seeing a firefly light up in the night sky is a reminder of just how incredible our natural world is. Seeing thousands of fireflies light up at once in a synchronous pattern is a wondrous event, and an opportunity that shouldn’t be missed. These fireflies are actually a species of beetle, and when they are trying to attract a mate their abdomen produces a chemical reaction that causes a brief glowing light to appear. There are many different species of fireflies that live in the Great Smoky Mountains National Park, but this particular species is the only one that has been observed with this synchronous lighting activity. Scientists are still unsure of why it happens, but we do know that it is a stunningly beautiful example of the diversity of wildlife in our region. Each year the park rangers designate a period of peak viewing for the fireflies— typically one week in late May to early June—and each night during this period they allow people who have won parking passes in the lottery to enter the Elkmont campground in order to get an up-close view of the most amazing natural light show around. The lucky attendees are asked not to use any cell phones or other light-emitting electronic devices in the area, and also to cover flashlights with red or blue cellophane in order to minimize the disturbance of the fireflies. The synchronous fireflies are one of the most unique natural events not just in the Smoky Mountain region, but in the entire world. If you have the opportunity to travel here for this amazing spectacle you should absolutely take your chance at the lottery, because you probably won’t get any other opportunities to see something like this in the wild. The parking pass lottery is run each year by the National Park Service. It typically opens in late April and only lasts for a few days, so make sure you don’t miss your chance to enter. The lottery is free to enter, and winners will be charged $20.00 for the parking pass to cover administrative fees once they are selected. You can enter online once the lottery goes live at the recreation.gov event page, or over the phone by calling 1-877-444-6777. You can learn more about the lottery process on the National Park Service’s website, and also check out their FAQ about the event. For more information about synchronous firefly viewings from past years, check out some of our prior blog posts. Watching for synchronous fireflies is just one of the many things to do in Gatlinburg and the Smoky Mountains. Good luck with that lottery, and enjoy one of the most beautiful natural events in the world!